We recently received an email from one of our readers named Maren. She is doing a great job building her food storage and wanted to know what she could do with potato flakes in addition to making mashed potatoes and thickening soups. We love our readers and appreciate the feedback. Maren, this one is for you. In this post, we are discussing potato flakes. They are quite different from potato gems, potato pearls, or dried mashed potatoes. You can also purchase these mashed potato products in #10 cans for storage, but they have a reduced shelf life due to the addition of oils and other ingredients. Let’s explore exactly why you should add dried potato flakes to your emergency food supply. Common ingredients in potato flakes include potatoes, monoglycerides, sodium acid pyrophosphate, citric acid. Sodium Bisulfite and BHA are added to preserve freshness. To make potato flakes, potatoes are washed and cooked and turned into a mash. Then they are spread by rollers and dried. The resulting product is known as potato flakes. Potato flakes will store longer and are more versatile in the ways that they can be used than instant mashed potatoes. You can add potato flakes to breads, cakes and even use them in candies. The other forms of potato products make great mashed potatoes but are limited in the other ways you can use them. 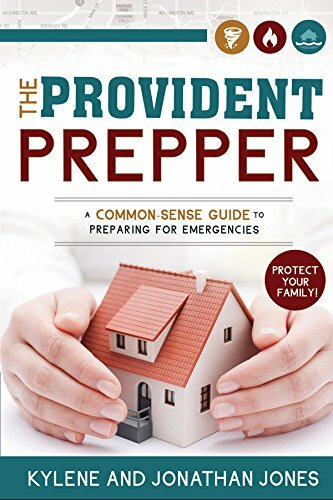 If I am living off of my survival long term food storage, I want to keep my options open. Potato flakes are a good source of Thiamin, Vitamin B6, Niacin, Vitamin C and Potassium. One prepared ½ cup serving will provide 17 grams of carbohydrates, 2 grams of protein and 80 calories. What Is the Shelf-Life of Potato Flakes? Actual shelf-life is always dependent upon the storage conditions. The best way to store potato flakes is in a cool, dry location. The cooler the storage room, the longer the potato flakes will maintain optimal flavor and quality. The packaging also factors into the shelf-life of potato flakes. Potato flakes that are packaged in a carton, box or bag are great in your short term storage and should be rotated in your normal diet. They should ideally be used within 1-2 years. Potato flakes stored in Mylar bags will store for 15-20 years when stored in a cool, dry location. You may want to add an additional layer of protection by placing the Mylar bags in a sealed plastic bucket. Potato flakes that are stored in a #10 can have an incredible shelf life of 25-30 years when stored under ideal conditions. Once the can has been opened the potato flakes should be used within a year. How Many Servings Are in a 2.3 Pound Mylar Pouch of Potato Flakes? A 2.3 pound Mylar bag contains 50 servings of 1/3 cups of dry potato flakes. Each serving contains 80 calories with 4,000 calories in the pouch. How Many Servings Are in a #10 Can of Potato Flakes? Honeyville Farms calculates the contents using a 50 calorie, ¼ cup of dry potato flakes as a serving size. That will result in 48 servings and 2,400 calories in their 1.5 pound (24 ounce) #10 can. LDS Family Home Storage calculates the contents using an 80 calorie, 1/3 cup of dry potato flakes as a serving size. That results in 39 servings and 3,120 calories in the 1.8 pound #10 can. Potato flakes are a good foundational ingredient for many recipes. We have listed a few ideas that you may want to explore a little further. 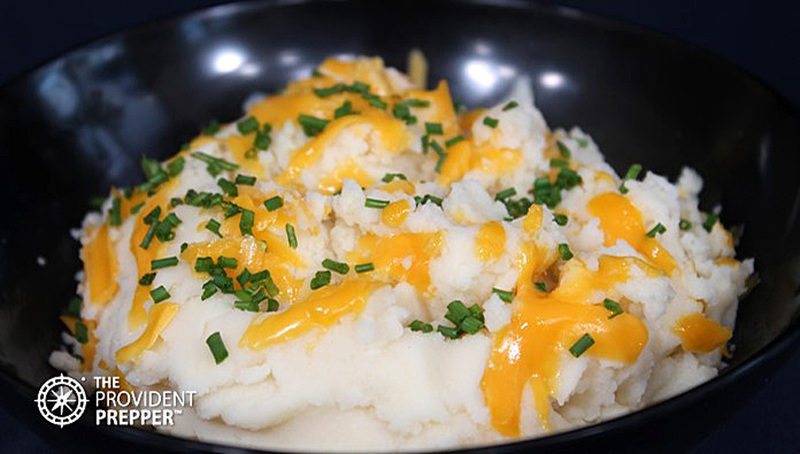 Don’t overlook the simple pleasure of a plate of hot mashed potatoes. Potato flakes can be turned into delicious mashed potatoes by bringing 3 cups of water, 1 teaspoon of salt, ¼ cup butter and 1 cup of milk to a boil and then adding 3 cups of potato flakes and stirring. Smother mashed potatoes with gravy. The possibilities are endless; chicken gravy, hamburger gravy, cream gravy, black pepper gravy, mushroom gravy, sausage gravy, roast beef gravy, egg gravy, giblet gravy, and onion gravy. Create a twice baked potato casserole. Just add a few chopped chives or green onions, sour cream, bacon bits or chopped ham, a little bit of garlic, parsley, salt, pepper, and sprinkle with shredded cheese. Bake and YUM! Make potato patties. Add herbs and spices, a little bit of meat and veggies, form into a patty and fry it up. Great way to use up leftovers or just enjoy something different. One of our family favorites is an easy goulash. I brown hamburger and chopped onion seasoned with a little garlic salt, and pepper. Then I add one can each of green beans, sweet corn, seasoned diced tomatoes, and kidney beans. It is served over hot mashed potatoes and is actually quite delicious for a last minute meal. Shepherd’s pie is always a family favorite. Brown hamburger with chopped onions and garlic. Add a little salt, pepper, Worcestershire sauce and a can of cream soup. Pour into the bottom of a baking dish. Cover with frozen or canned veggies. Add a layer of mashed potatoes, top with shredded cheese and bake. Mashed potatoes make a nice crust for a quiche. Press the mashed potatoes onto the bottom of a greased pie plate. Bake in a 350-degree oven until the edges are golden brown (30 minutes). Add the filling and bake another 25-30 minutes. You can replace the cornstarch or flour in your favorite gravy recipe with potato flakes. Potato flakes work best as a thickener in gravies and sauces if you blend them for a minute in your food processor to create a potato flour. It will add a hint of potato flavor and you don’t need to worry about it clumping. It is a nice gluten-free alternative. Add potato flakes one teaspoon at a time to add body and thicken soup as needed. Stir well after each addition until you reach the right consistency. A potato soup base can be created by using 1 cup of potato flakes and 4 cups of liquid (water, broth, milk). Add other ingredients to make broccoli soup, ham potato soup, potato corn chowder, loaded potato soup, chicken potato soup, clam chowder, and cheesy potato soup. Use your imagination and come up with great combinations. Create a light, crispy coating for baked or fried chicken, fish or pork. Replace the usual breadcrumbs or cornmeal with potato flakes for a gluten-free alternative. Dip the meat into an egg wash or milk, and then dredge them in a mixture of potato flakes, parmesan cheese, and seasonings. You can bake them or fry them. Try a combination of potato flakes, panko bread crumbs, and spices to create a delicious coating for fried or baked onion rings. You don’t need to limit yourself to onions. Try dipping broccoli, cauliflower, eggplant, mushrooms, zucchini, okra, green tomatoes, and other vegetables in the coating mix, bake or fry, and enjoy! Just for fun, you may want to try it with mozzarella sticks. Replace your filler (breadcrumbs, oats, cracker crumbs, rice, etc.) with potato flakes in your favorite recipe for meatballs or meatloaf. The potato flakes take on the flavor of the meat nicely and make expensive meat stretch a little bit farther. Potatoes are a natural dough conditioner. 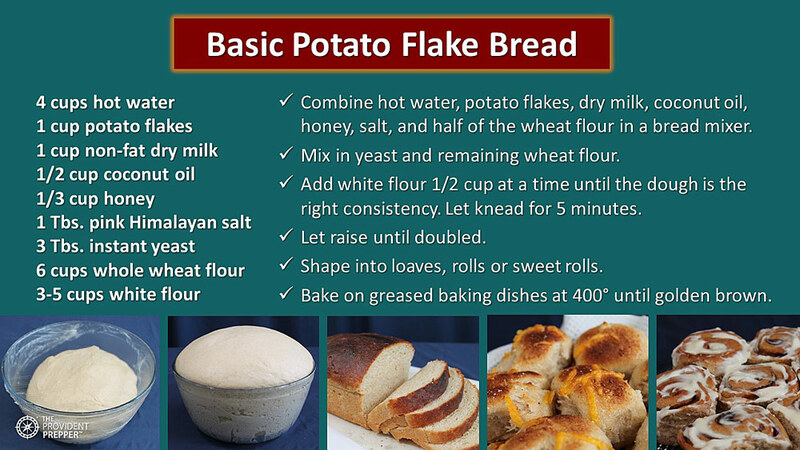 Add some potato flakes to your breads to give them a softer, fluffier texture. The potassium in the potatoes reacts with the yeast and helps the dough to rise faster. Rolls, biscuits, tortillas, and even pancakes benefit from a few potato flakes added to the dough or batter. This is my basic potato flake bread dough recipe. It is has just a hint of sweetness from honey and can be used as a foundation dough for a variety of other recipes. A loaf of fresh hot bread disappears quickly in our home. The potato flakes create a beautiful, amazingly soft and delicious bread. You will never suspect that the primary ingredient is fresh ground whole wheat flour. I used that basic dough to make delicious garlic parmesan dinner rolls with this recipe. I melt butter and add a bit of garlic salt and parmesan cheese. Each little ball of dough is dipped into the garlic butter mixture and placed in a baking dish. I add just a little bit of shredded cheese on top to make them look amazing! Sweet rolls are a family favorite. Roll the dough out and cover with a mixture of melted butter, coconut or brown sugar, and cinnamon. Roll up the dough, cut into 1-inch pieces, and place in a baking dish. Let them cool for 5 minutes and smother in cream cheese frosting. YUM! Potato flakes can be added to brownies, donuts, cakes, muffins, and even some types of candy. It will amaze you what recipes can benefit from a few added potato flakes. Potato flakes are an ideal candidate for long term food storage. They have a fantastic shelf life when stored correctly. Preparation can be as simple as rehydrating with hot water if the situation demands it, or as complicated as delicious potato rolls to complement any meal. Potato flakes can add diversity, nutrition, and flavor to a variety of dishes and help your survival food storage taste like a delightful home-cooked feast. Consider adding some to your food storage today. You may be interested in exploring these posts to help you build your family food supply.